In 1869 Russian scientist Dmitri Mendeleyev was puzzling over a way to bring order to the fledgling science of chemistry. Wearied by the effort, he fell asleep at his desk. What he dreamt would fundamentally change the way we see the world. 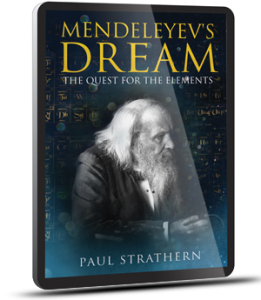 Paul Strathern tells the dramatic and entertaining story of humankind’s quest to discover the fundamentals of chemistry, culminating in Mendeleyev’s dream of the Periodic Table. “MENDELEYEV’S DREAM is a wonderfully entertaining and stimulating journey from alchemy to chemistry in search of the elements of our universe.